Congress is currently working with the FAA to develop new regulations which would prevent the UAVs from interfering with any manned aircrafts, as well as manned agricultural airplanes and helicopters; these changes are expected to take effect by 2015, and would allow drones to be used for commercial applications. Researchers are using and developing drones right here in Lake Alfred, Florida. Dr. Reza Ehsani is an Assistant Professor of Agricultural and Biological Engineering at the UF/IFAS Citrus Research and Education Center. Dr. Ehsani began working on this technology at UC Davis in 2000. At that time, aerial imaging and satellite were being used in tandem to survey crops for issues. However, this method was expensive, produced images with poor resolution, and had limited availability at times due to cloud cover. With the emergence of HLB, or citrus greening, the dire need for scouts to detect this disease brought about a renewed interest in UAVs. Dr. Ehsani and his colleagues tried to employ remote control airplanes to do the scouting, but this method requires the operator to be extensively trained in remote control aircrafts, and the images were not sophisticated enough to be used in research. The problem was resolution: in an image taken by a commercial UAV, one citrus tree would be represented by 100 pixels. The new UAV he has developed at the CREC uses about 5000 pixels for one tree. According to Dr. Ehsani, “Resolution is addictive.” With such a high resolution, it is much easier to identify any disease or distress in the trees. Dr. Ehsani’s innovation is simpler to use, more cost efficient, and produces images with a higher resolution. The sensors on the UAV can detect any biotic or abiotic stress, such as wind damage or pesticide burns, detect disease, and manage inventory of the field. Thermal cameras are used to capture images without any human having to go to the field, or even leave their computer. Using Google Earth to program the UAV with GPS way point navigation, all the user needs to know is how to turn the UAV on, program it, and turn it off. The user can program the altitude, camera angle and tilting ability, and even the length of time the UAV stays over each programmed way point. The multiple images captured from the UAV can be stitched together to make an entire map of the field. This technology is not strictly for use in citrus— in South Florida researchers are also using this technology to help detect the presence of Laurel Wilt, a disease that affects avocados and is comparable in severity to HLB in citrus. Researchers are working on developing more advanced sensors for UAVs which are superior to human capabilities of sight and interpretation; early detection of disease is crucial for the agriculture industry. Dr. Ehsani also proposes that drones could be used in other countries to detect diseases that currently do not affect the United States, so researchers could potentially develop a solution to the disease before it even reaches U.S. crops. 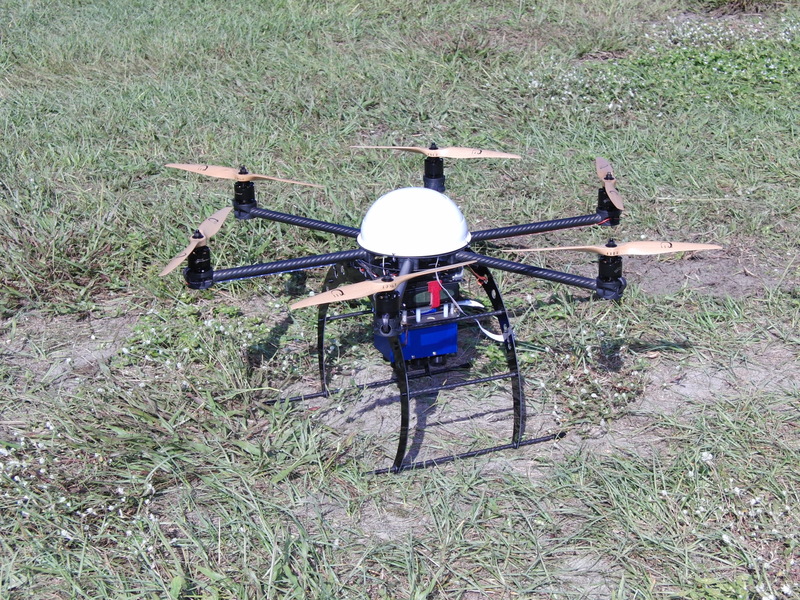 The USDA is currently providing funding to develop aerial and ground robots who work as a team to collect field samples. This technology is revolutionizing the agricultural industry nationwide, and has particularly useful applications for Floridian growers. There is a demonstration in Orlando this May put on by AUVSI (Association for Unmanned Vehicle Systems International) for any growers or private companies who are interested in more information about Florida applications of drones. For more information about the demonstration, visit AUVSI.org.